Shopping for a new Toyota Tundra? The Tundra’s 5.7-liter V-8 is thirsty, but it’s worth the extra cost over the smaller V-8 due to its strong pulling power. 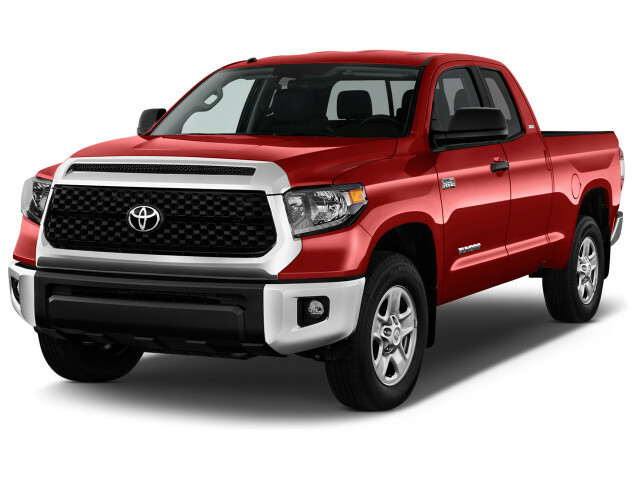 The 2018 Toyota Tundra offers a strong V-8 engine and good advanced safety tech, but it comes up short in terms of fuel efficiency and interior quality. Curb weight: 4,920 to 5,670 lbs. The 2018 Toyota Tundra is on the sidelines in the pickup truck arms race. Its big V-8 isn't very fuel-efficient, nor the most powerful. 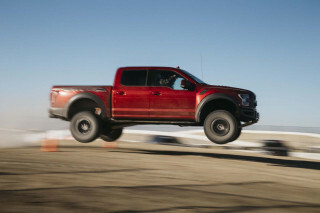 It lacks tech found on other trucks—and pizzazz. Most who will consider the Tundra will be Toyota loyalists who wouldn't consider a truck from the Detroit Three. For 2018, Toyota has made a bunch of changes to the Tundra, which is available in SR, SR5, Limited, 1794 Edition, Platinum, TRD Pro, and TRD Sport trim levels. The regular cab model has been dropped, but we doubt anyone will miss it. Instead, buyers may find a lot to like in the stylish and new TRD Sport, while every Tundra has an updated look outside thanks to new grille and headlight designs. Additionally, we commend Toyota for making automatic emergency braking, automatic high beam headlights, lane departure warnings, and adaptive cruise control standard on every Tundra. 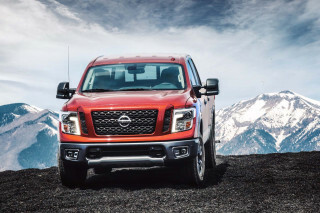 All Tundras are powered by V-8 engines; a 310-horsepower 4.6-liter is standard on SR and SR5, while a muscular, 381-horsepower 5.7-liter V-8 comes on all other models. Every Tundra’s V-8 is mated to a 6-speed automatic. Rear-wheel drive is standard on most models, and four-wheel drive with a two-speed transfer case is available. The Tundra lineup isn’t quite as extensive as those offered by Detroit’s Ram, Ford, GMC, and Chevrolet brands, but there are still enough flavors available that you’ll want to spend some time deciding which one best suits your needs. Credit Toyota for some creative touches, but overall the Tundra isn't the best looking truck out there. A mild styling update outside keeps the 2018 Toyota Tundra fresh, although it’s not as stylish as some competitors. The Tundra is available in extended cab and crew cab configurations and its wide range of trim levels starts with work-spec SR with unpainted bumpers and steel wheels before working through the chrome-laden 1794 Edition (named after the San Antonio ranch on which the Tundra assembly plant was built) all the way up to monochromatic TRD Sport and TRD Pro versions. Each has its own flavor, executed quite well with unique grilles, headlight finishes, wheel designs, and badging. Inside, the Tundra’s dashboard is wide and symmetrical, with controls logically arrayed. It’s effective, but stops well short of attractive due in part to extensive silver-painted plastic. Remember when electronics manufacturers painted every TV and DVD player silver? Yeah, that was 15 years ago. Same story here. The Tundra's muscular V-8 engine and good ride quality are offset slightly by numb steering. Toyota doesn’t offer the 2018 Tundra in quite as many flavors as most truck manufacturers do, but those that are available perform well with strong power and an above average ride quality. Unlike its Detroit rivals, the Tundra is fitted only with V-8 engines. 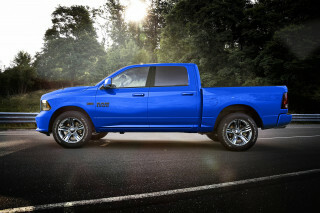 A 4.6-liter V-8 rated at 310 horsepower and 327 pound-feet of torque comes standard on SR and SR5 trim levels. Optional on those and standard elsewhere is a stronger 5.7-liter V-8 rated at 381 hp and 401 lb-ft. Both V-8s are mated exclusively to 6-speed automatic transmissions and most models come standard with rear-wheel drive while offering four-wheel drive as an extra-cost option. Either V-8 is smooth and strong, but the 5.7-liter is only marginally thirstier while delivering far more power. Floor the 5.7 and you’ll be rewarded not only with ferocious acceleration, but also with a muscle car exhaust note. Aiding the V-8s are smooth-shifting automatics; they might be down on gears compared to the latest 8- and 10-speed units used elsewhere, but they get the job done well. All Tundras use a conventional double-wishbone front suspension and a live axle out back with leaf springs. Ride quality is good with everything from the standard 18-inch wheels to the 20s found on Limited, Platinum, and 1794 Edition trim levels. TRD Pro models are aimed at off-road users and they do a nice job of improving capability without sacrificing real-world usability. Underneath, they feature a 2-inch suspension lift up front for a pre-runner look and special Bilstein shocks with remote reservoirs. Though not as extreme as the Ford F-150 Raptor, the Tundra TRD Pro takes rocky roads in stride while still being perfectly docile around town. At the opposite end of the spectrum, the new-for-2018 Tundra TRD Sport is aimed more at paved road use with its own Bilstein shocks and beefed up sway bars front and rear. We’ve not driven a TRD Sport yet, but we look forward to getting some behind-the-wheel time to see if the slightly stiffened suspension improves this truck’s somewhat cumbersome road manners. Numb, light steering is par for the course for big trucks, but the Ram 1500 has shown us that a hauler can deliver at least a modicum of road feel through the steering wheel and we’re optimistic that Toyota is after the same goal with its TRD Sport. All versions of the Tundra except the TRD Pro come standard with rear-wheel drive and offer four-wheel drive as an option. As you might expect for an off-roader, the TRD Pro is 4x4-only. Toyota’s four-wheel drive system is easy to operate with a dash-mounted knob, but it is a part-time system not meant for use on dry pavement. Most rivals offer an automatic mode suitable for use on any kind of terrain, something that’s useful in light snow or on a rainy day. 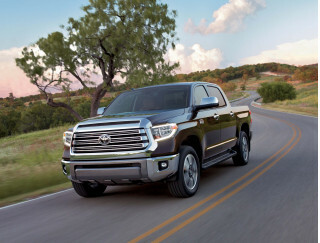 Depending on configuration, the Tundra’s V-8s are rated to tow as much as 10,300 pounds and a gross combined maximum towing rating of 16,000 pounds. That’s plenty, but it lags the best of the domestics. A big 38-gallon fuel tank is standard on most trim levels (and optional on the SR5). SR and SR5 trims come standard with a 26.4-gallon tank. While there's plenty of room in the Toyota Tundra, its interior feels decidedly downmarket. There’s plenty of space for five adults in most versions of the 2018 Toyota Tundra, but don’t expect the experience to be lavish even on the top-of-the-line 1794 Edition. Toyota has dropped the slow-selling regular cab Tundra this year to focus instead on extended and crew cab versions branded as Double Cab and CrewMax, respectively. Tundra Double Cab versions come standard with a front bench seat with a massive fold-down armrest plus tight rear seats accessed by their own front-hinged doors. The rear seats on Double Cabs feature a particularly upright backrest and the doors’ side windows are small, leading to a more confining feel. Two bed lengths are available on Double Cabs: 6-foot-6 and 8-foot-1. The Tundra CrewMax is more popular, and for a reason. Its back seat is spacious, with plenty of stretch-out room and a reasonably comfortable bench that folds up for large item storage. 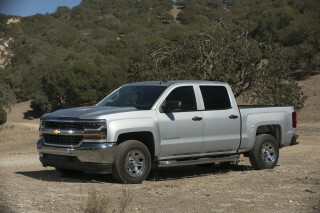 The crew cab is only offered with a 5-foot-5 bed. Though our test Tundras have felt solid, their interior materials have ranged from predictably basic on SR and SR5 models to an odd combination of gorgeous, soft brown leather upholstery mixed with work truck-grade plastics on the 1794 Edition. The Toyota Tundra leads the segment in terms of standard safety tech, but crash-test results are so-so. The 2018 Toyota Tundra adds a raft of safety tech this year. We applaud Toyota for making automatic emergency braking with pedestrian detection, adaptive cruise control, lane departure warnings, and automatic high beams standard on every model. Federal and independent testers weren't as kind. The Tundra earned a four-star overall score from federal testers and a rare three-star score in rollover crash safety. 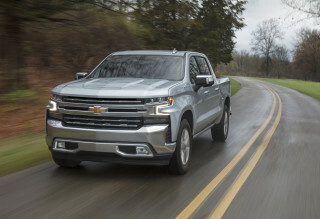 The IIHS gave the truck a "Marginal" score on small-overlap crash protection, and a "Poor" score for headlight efficacy. In addition to this year’s new features, all Tundras are equipped with a rearview camera, eight airbags, and a limited slip differential. Front and rear park assist is optional on most trim levels. Good infotainment and a wide range of options help the Tundra stand out. Pickup trucks have always been highly configurable, and the 2018 Toyota Tundra is no exception. Starting with the Tundra SR, which is available in Double Cab and CrewMax configurations, the Tundra is fairly well-outfitted. The SR includes air conditioning, power windows and locks, a 6.1-inch touchscreen infotainment system with a USB input and Bluetooth, and, new for 2018, a full suite of safety equipment including automatic emergency braking, adaptive cruise control, and lane departure warnings. The Tundra SR5 builds on that a 7.0-inch touchscreen infotainment setup that also adds a smartphone-connected navigation function called Scout that relies on a user’s data plan, HD Radio, satellite radio, and chrome bumpers. It’s also available with a wider array of optional equipment like blind-spot monitors, rear cross-traffic alerts, and a power driver’s seat. From there, the lineup gets either more decadent or more capable, depending on which direction you choose to go. TRD models are more enthusiast-oriented, starting with the new TRD Pro. It rides on its own Bilstein shocks and has large sway bars, plus special styling outside and unique upholstery inside. The TRD Pro is the most off-road capable Tundra and it features a 2-inch front lift, all-terrain tires, Bilstein remote reservoir shocks, and other rugged bits. What does the TRD Sport get? Those who want a cowboy Cadillac—or maybe a lassoed Lexus?—should start with the Tundra Limited. 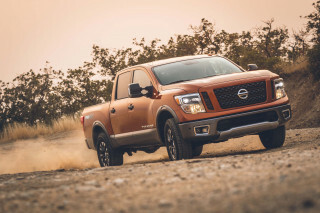 It adds alloy wheels, leather upholstery, woodgrain trim, built-in navigation that doesn’t rely on a data connection, heated front seats, and JBL speakers. Both the Tundra Platinum and Tundra 1794 Edition are outfitted about the same, at least on paper. They both have upgraded leather trim, cooled front seats, 20-inch wheels, and sunroofs. Where they differ is in their execution. The Western-themed 1794 Edition, so named because of the year the ranch on which Toyota’s San Antonio assembly plant was founded, predictably is available in earth-toned and is slathered with chrome. 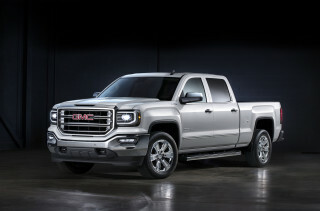 The Platinum goes for a more subdued, upscale look, with color-matched bumpers and toned-down badging. 1794 Edition and Platinum trim levels are only available as crew cabs. While they’re well-equipped, they don’t approach the level of coddling decadence of some rivals. Then again, a loaded up Tundra is in the mid-$50,000 range, while some competitive trucks approach $70,000. 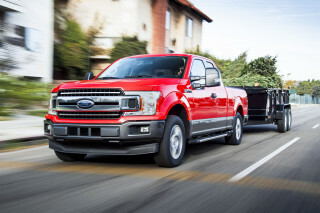 Are massaging seats in a loaded Ford F-150 worth the extra cost? That’s up to you. Even by pickup truck standards, the Toyota Tundra is a guzzler. The 2018 Toyota Tundra boasts a lot of muscle under its hood, but the flip side to that power is below-average fuel economy. The thriftiest is the rear-wheel-drive 4.6-liter V-8, rated at 15 mpg city, 19 highway, 16 combined. Opt for four-wheel drive with that motor—SR and SR5-only—and those figures drop to 14/18/16 mpg. The 5.7-liter V-8 optional on SR and SR5 and standard elsewhere is rated at 13/18/15 mpg with rear-wheel drive. Four-wheel drive models are the thirstiest overall at just 13/17/15 mpg. One bright point is that the Tundra’s V-8s run on regular unleaded. Additionally, the 5.7-liter V-8 is offered in an E85-capable model for those in the corn belt. Fuel economy is below MFG. stated on purchase invoice. I'm currently getting an average of 7 1/2 to 8 1/2 mpg on average city and hwy driving ( not towqing). Perfect ride unless you have pain in your feet. Vibrations get to me but it is bearable. The quality of the build is unmistakable. No problems will be expected for the 8 or 10 years we own it. Looking for a different year of the Toyota Tundra?